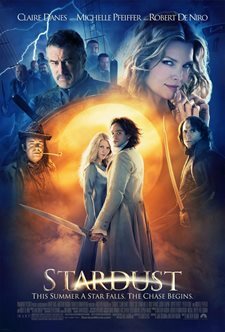 From the imaginations of best-selling author Neil Gaiman and director Matthew Vaughn comes "Stardust," the enchanting tale of a fallen star who crashes into a magical kingdom -- and turns out to be no ordinary meteorite at all, but a beautiful, imperiled woman chased after by an incredible array of seekers who want or need her secret powers. From wicked witches to power-mad princes, from flying pirates to dueling goblins, each person who encounters the star has his or her own agenda, but they all desire just one thing: her heart. any age to fall in love with fairy tales. "Stardust" begins in the sleepy English village of Wall, so named for the cobblestone wall that has, for eons, kept the villagers safely apart form the supernatural parallel universe that lies just on the other side. It is here that young Tristan Thorne (CHARLIE COX) makes a wild-eyed promise to the prettiest girl in the village (SIENNA MILLER), whose heart he hopes to win: that he will bring her back a fallen star. Now, in order to make good on his promise, Tristan will have to cross the forbidden wall, and enter a mysterious kingdom lit by unending magic and unfolding legends of which he will quickly become a part. In this fantastical realm known as Stormhold, Tristan discovers that the fallen star is not at all what he expected but a spirited young woman (CLAIRE DANES) injured by her cosmic tumble. Now, she is in terrible danger - sought after by colossal powers including the King's (PETER O'TOOLE) scheming sons for whom only she can secure the throne; and a chillingly powerful witch (MICHELLE PFEIFFER) desperate to use the star to achieve eternal youth and beauty. the strength of his newfound love, Tristan will also uncover the secret key to his own identity and a fate beyond his wildest dreams. star encounters has an agenda, some good, some evil, yet they all desire just one thing: her heart. fall in love with fairy tales. Unfolding on both sides of a parallel universe separated by only a thin barrier of stone, "Stardust" reveals just how amazingly close the familiar and the totally fantastic can be to one another. Starring an extraordinary cast of exciting newcomers, rising stars and Hollywood legends -- including Charlie Cox, Claire Danes, Robert De Niro, Sienna Miller, Michelle Pfeiffer, Jason Flemyng, Henry Cavill, Ian McKellan, Rupert Everett, Peter O'Toole, Ricky Gervais, Nathaniel Parker,Sarah Alexander, Kate Magowan, Melanie Hill and Joanna Scanlon -- "Stardust" is this summer's most original escape into enchantment. Download Stardust in Digital HD from the iTunes store. Stardust images are © Paramount Pictures. All Rights Reserved. Neil Gaiman has written some absolutely shattering graphic novels (Sandman), some pretty good books (American Gods), and some films that while innovative rarely achieve the same level of shock and awe (Mirror Mask). Part of this is because Gaiman's strength is in complex interwoven storylines where characterization is set in context with a much larger situation. Part of this is because where Gaiman really excels is the creation of new, iconic, mythologies with recognizable literary underpinnings. When he does this correctly, his gods, demons, and backdrops are resonant. But this is hard to do in a 2hr movie. Stardust is based on about 10.5 hours of material in the original 1998 graphic novel by the same name (and the same author). It's a fairy-tale set about 150 years ago where a young man journeys through a hole in a wall (in the town of Wall) that separates our world from a magical one. He's going to find a fallen star and return it to his beloved so he can win her hand in marriage--she doesn't really respect him that much (he's a shop-boy) and is dating one of those arrogant good-at-everything jerks that appear pretty often in cinema ... and for a specific reason. And, of course, on the other side of the wall, is a cross-fire of magical intrigue around princes and witches who want the star for themselves. 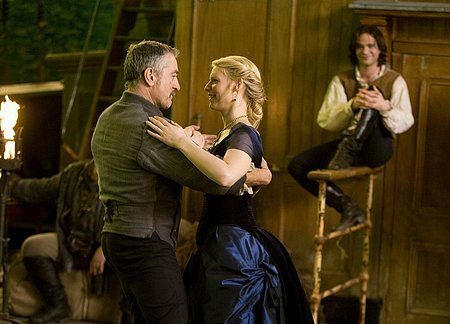 The star is played by Claire Danes, who has been knocked from the heavens by accident and now can't get back ... without help (and certainly does not want to be the captive prize of a love-struck shop boy). Adventure ensues. So, is it good adventure? Yes: it is pretty darn good adventure. Gaiman knows how to work a fantasy world with internal logic and this carries through into the shorter, tighter movie script. The original books were quite dark (and had mature themes) but the film is a good deal lighter (it was compared, reasonably, to the Princess Bride--although without the humor focus). There are witch-battles, princes killing each other off, ghosts, and sky-pirates with a flying blimp / sailing ship who bottle lightning and are run by Robert De Niro. The screen writers (Jane Goldman and director Matthew Vaughn) give us a steady build up with satisfying set-pieces and drama in an arc that takes us exactly where we think it's going to go. The acting is good. The F/x are good. Claire is pleasant to look at and everything falls into place. If I have a complaint, it's that: the show clocks in at a somewhat edgy PG-13 but doesn't really challenge us. There is a mechanical injection of "the stupid" where two major characters simply must misunderstand each other in order to feel betrayed (fortunately the movie doesn't linger here). There is an ending sequence that absolutely floored me until they took it back (a main character decides things didn't really need a final, climactic battle ... then, oh wait, yes they do). This is all the more noteworthy because there are places in the movie where it does give us pause. The pirate captain (Shakespeare) turns out to have several layers of secrets that "had better not come out"--and do. The scene where the boy returns to the human side of the wall avoids complete cliche. There are glimpses of what might've happened with another hour and an R rating (or, maybe, Terry Gilliam at the helm--he was picked for it first but begged off due to being sated with fairy tales after The Brothers Grimm ... maybe this is a good thing, considering how The Brothers Grimm came out). 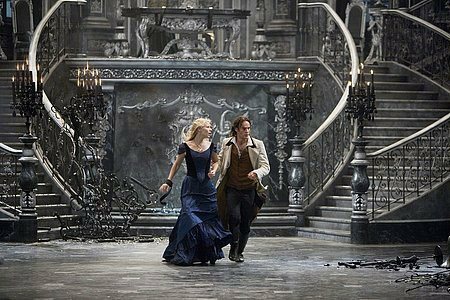 Stardust images © Paramount Pictures. All Rights Reserved.